New inclusionary zoning regulations give cities the power to design and draft flexible bylaws around the development of affordable housing units. Toronto has been handed a “new tool to create more affordable housing” with the release of provincial rules that give cities the authority to decide the number of lower-cost units that must be included in new developments. That power is outlined in updated regulations around “inclusionary zoning,” a legal tool municipalities can use to force developers to create affordable units. Cities will also have the power to determine how long those units remain affordable and what measures or incentives can be used to offset the cost of development. The regulations, released Wednesday by provincial housing minister Peter Milczyn, will apply to buildings with 10 units or more, unless cities determine a higher threshold works best for local growth, or the development is proposed by a non-profit housing provider, or if a non-profit housing provider has an interest greater than 51 per cent. Cities will also get to decide how many units go into purpose-built-rentals or condominium buildings. 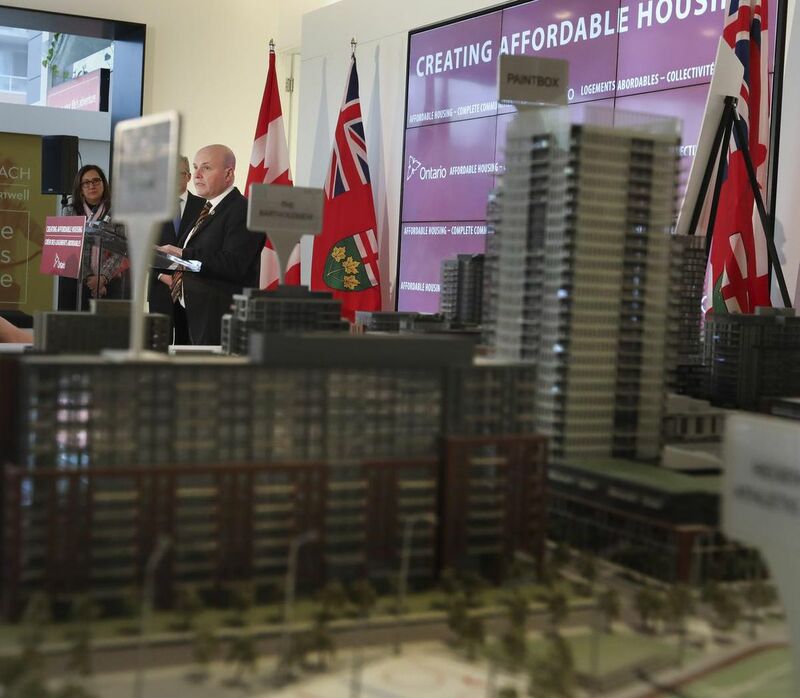 Milczyn, one of several political leaders and housing advocates to use the tool analogy, revealed the new, flexible regulations at a news conference in Regent Park. “When people have access to safe and affordable housing, they have a strong foundation for better education, health and employment opportunities,” said Milczyn, in a written statement. Deputy Mayor Ana Bailao, the city’s affordable housing advocate, said the province’s support for “local decision making” means the city can work with developers and partners to keep Toronto growing, but remain inclusive. “With housing costs increasing significantly in major cities around the world, we need local tools to address the challenges of housing affordability,” said Bailao, in a news release after the announcement. Cities are required to put together a detailed report on existing housing and demand and Toronto city staff — after a period of study and consultation — are aiming to get a draft policy and framework to council by early 2019, which will eventually result in a bylaw. Housing advocates have been pushing for regulations that give local governments the flexibility to design bylaws that meet each city’s unique needs. In Toronto, the active wait-list for subsidized housing hit almost 92,500 households in late 2017, according to information provided by the city. With this regulation the province has “hit the nail on the head,” said Joy Connelly, a member of the HomeComing Community Choice Coalition. When draft regulations came out in January, the suggested rules were met with immediate pushback from housing advocates both in and outside city hall. The province accepted feedbackon those draft rules until Feb. 1. If that older version of the regulation had stood, Toronto would have had to choose between exempting developers from funding much needed community benefits, or pay developers 40 per cent of the cost of the units. On the development side, the draft rules only required the temporary creation of 5 to 10 per cent of affordable units and that they remain affordable for 30 years, but only in condominiums. The new and finalized rules were not welcomed by the Ontario Home Builder’s Association, which accused the province of “shirking” its responsibilities, by releasing regulations with “no policy framework” on the eve of a provincial election. “Leaving housing providers to negotiate how to provide government-mandated affordable housing with municipalities will only make things more political and fuel more NIMBY-motivated actions and councillors,” said Joe Vaccaro, the association’s chief executive officer, in a news release. Whether city council “steps up” and creates a bylaw that balances growth with the creation of enough affordable units is something city builders across the province will be keeping a close watch on, said Brian Eng, a member of Social Planning Toronto’s inclusionary zoning working group. Social Planning Toronto was heavily involved with pushing for flexible regulations. Planned properly, this “will be the most effective generator” of inexpensive or accessible housing for people in Toronto, said Eng, who said Social Planning Toronto suggested between 10 and 30 per cent of units in each building fall into the affordable category, but again, those parameters must be decided by cities. “As long as there is development going on you are going to have new affordable housing,” he said.